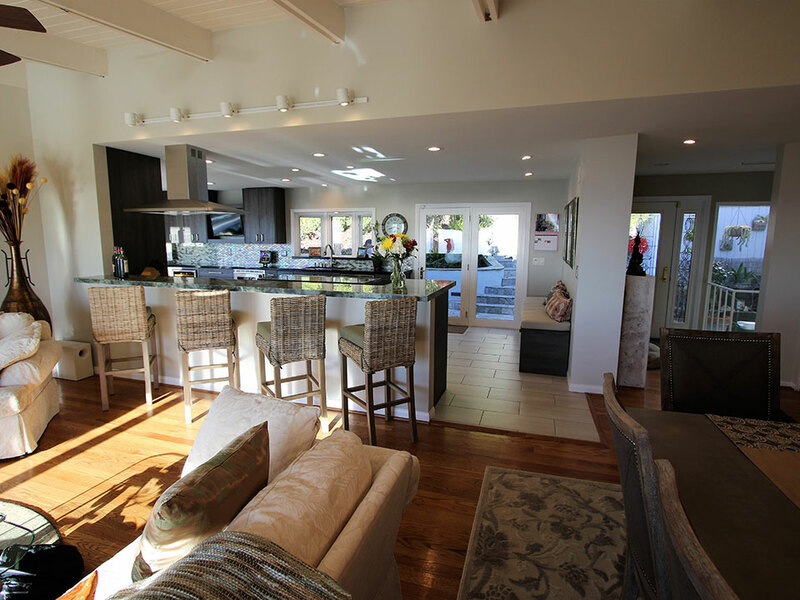 Originally walking into this Laguna Beach home, there was a sense the kitchen was outdated and needed a breath of fresh air. It was closed off from the living and dining area, and there wasn’t the feeling entertaining would be easy, nor was the space as functional as it could be, due to this layout. The goals of this redesign were not just to open up the kitchen and create an open, airy sense of flow, but also to modernize the old space and create instead a home that reflected the owner’s love of art and contemporary design. 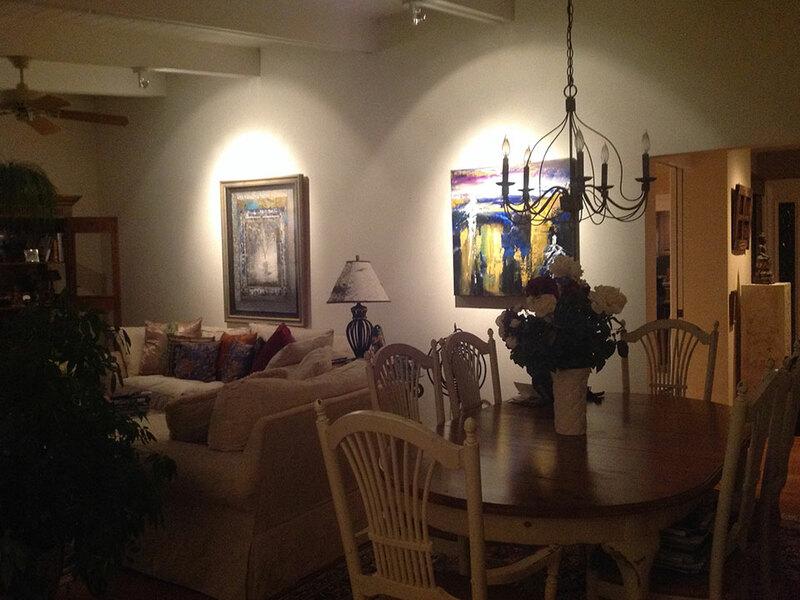 To begin, the layout was revamped to create an open-concept design, with clear sightlines from the kitchen into the entirety of the living and dining room. 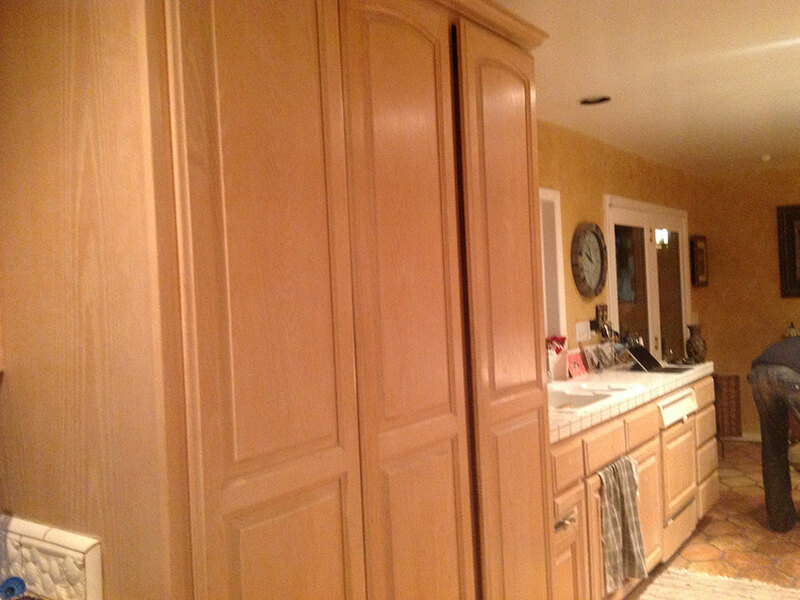 The next step in the process included the replacement of the light-colored cabinetry and tiled countertops, as well as the Spanish tile flooring in the kitchen. The new kitchen design reflects a completely revamped footprint, where glass doors lead to the patio on one side, and on the other side, there is a casual dining nook set against the backdrop of vast windows which lead to a scenic deck. The central area of the kitchen includes an island which anchors the design, and the primary wall includes ample custom Sophia Line cabinetry in Aspen Oak. 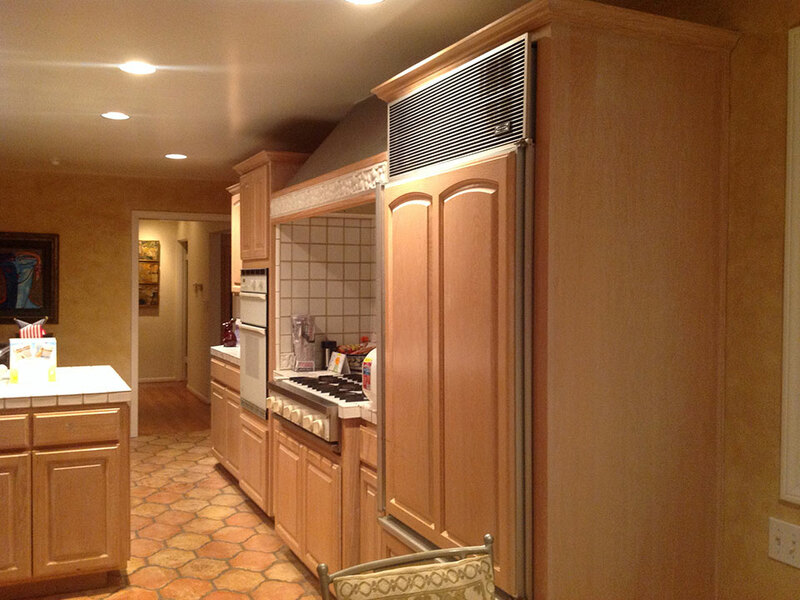 The main kitchen wall is also where the vast basin sink is located, as well as the built-in microwave and dishwasher. 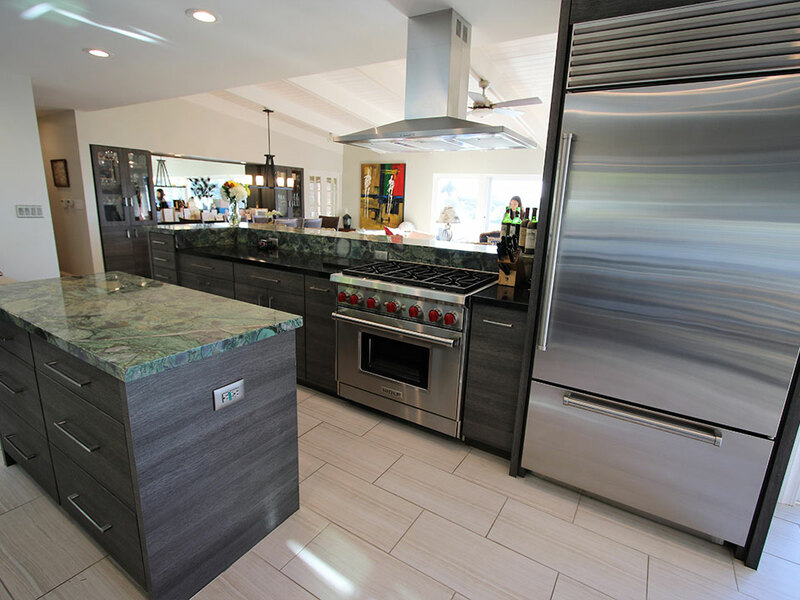 The island includes additional storage, and then, where there was once a wall separating the living and kitchen areas, there is now a long L-shaped bar area, a 36-inch Wolf cooktop, and a modern stainless steel range vent. 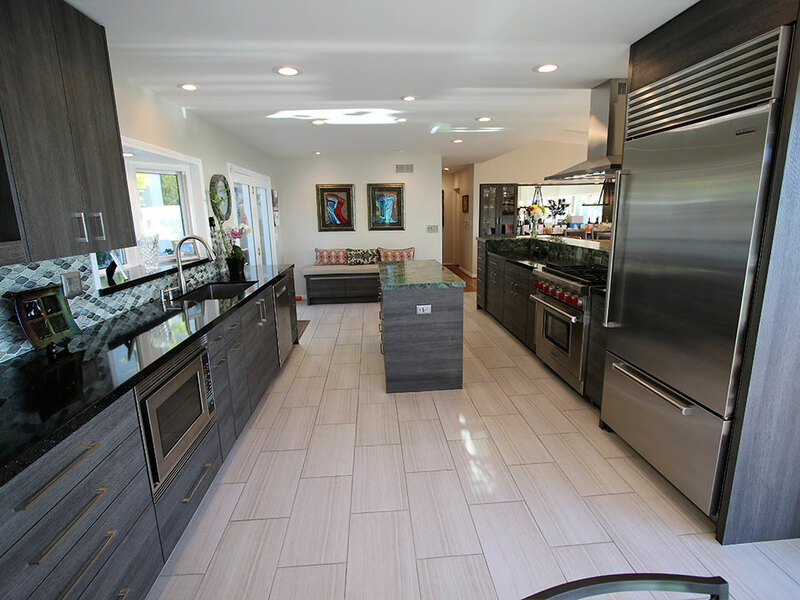 This Laguna Beach kitchen also includes a built-in Avanti beverage center and a Sub Zero built-in refrigerator. The Sophia cabinetry has soft close upgrades, and the selected graining of the custom cabinetry alternates between a horizontal and a vertical pattern, adding visual interest and a distinctive visual element. The backsplash against the primary wall is iridescent with subtle multicolored arabesque tiles. The countertops, with a 1 ½ inch straight edge, continue the contemporary design of the kitchen and feature a rich, emerald green color palette. The island top is eye-catching with agate gem details. Recessed lighting illuminates the kitchen, as does the natural light from the many large windows and doors, and a light plank tile runs throughout the kitchen and seamlessly meets the hardwood flooring in the living room. A custom bench sits at the far end of the kitchen and is designed with the same Sophia Line cabinetry, adding not just a sitting area, but also additional hidden storage. 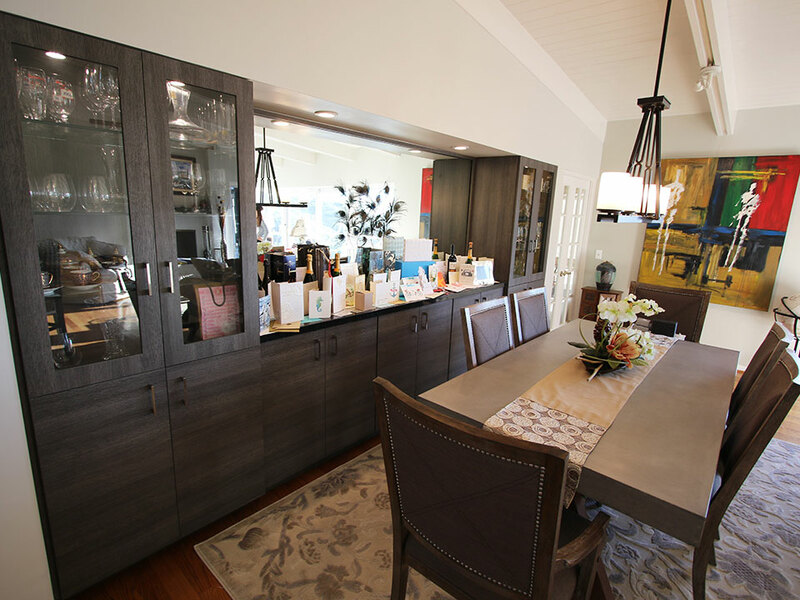 Another component of this large-scale Laguna Beach remodel was the design and construction of a custom buffet for the dining room, using again the Sophia Line cabinetry. There is a countertop space that’s part of the buffet, as well as hidden storage and glass-front cabinets, perfect for displaying some items. 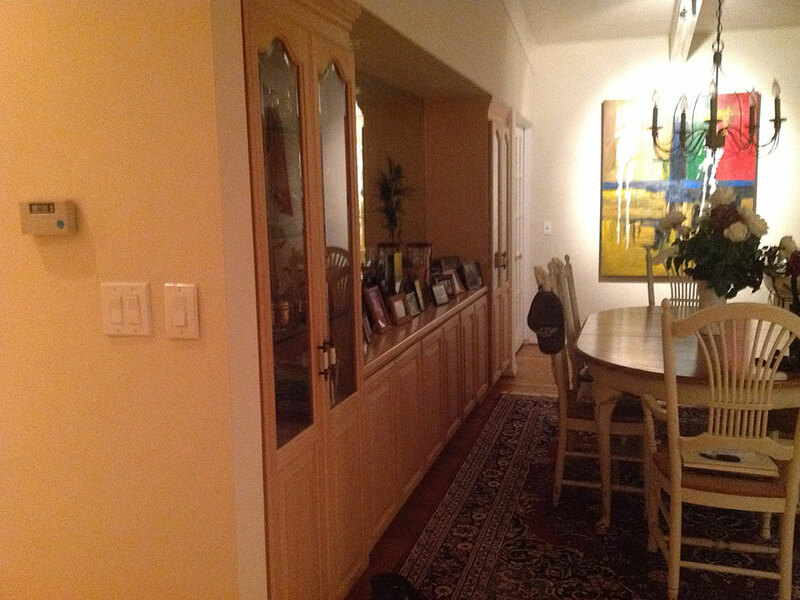 It ties the dining area together with the kitchen as well as adding an improved level of functionality.